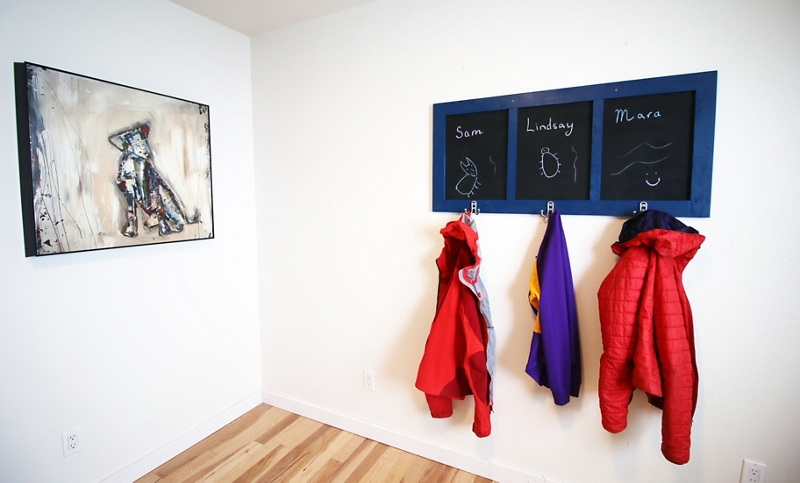 Keep your entryway organized with a Krylon chalkboard coat rack – everyone’s coat has a home! Sand boards prior to assembly. Assemble the frame. Use a pocket hole jig to create two pocket holes at the end of each long board. Set it for ¾ inch thick stock. Use 1¼ inch long pocket hole screws and wood glue at each joint to connect the boards. Use a router with a ½” rabbet bit to create an inset for the plywood to rest in. This will allow it to lie flush inside the frame. Go around the inside perimeter of the frame. The rabbet will be ½ inch wide by ¼ inch deep. Use a circular saw to cut the ¼ inch plywood to size. It should be cut to fit in the inset. Use a miter saw to cut a 45 degree angle at each corner of the plywood so it will fit. It is recommended to spray paint the project prior to assembling the coat rack frame with the plywood that will be the chalkboard surface. Dust and wipe down the wood with a tack cloth. Use a drop cloth or tarp to cover a flat surface. Before starting to spray paint, read the Krylon labels for safety and application instructions. The pictured project required a full can. Using Krylon® ColorMaster® Paint + Primer in Satin Oxford Blue, paint the entire frame. Paint the rectangular piece of plywood with Krylon® Chalkboard Paint in Black. For the pictured look, use three coats. Allow the Krylon® Chalkboard Paint to 24 hours before first use with chalk. Once the frame and plywood chalkboard are fully dried, assemble the coat rack. Secure the chalkboard from the backside using ½ inch nails. For pictured project, 18 gauge nails in an air nailer were used. Measure 12 inches in from each side and add the ½ inch thick trim boards as separators with ¾ inch long nails. You’ll end up having a total of three 12 inch sections of chalkboard once the separators are added. Add three rack hangers centered under each chalkboard section and secure using ½ inch long screws. Find the studs in the wall and then secure the coat rack using 3-inch long wood screws.